It’s always a troubling feeling for any Victorville driver when you turn on your car, only to see that yellow “Check Engine” light glowing on your dash. The car appears to be driving well; there’s nothing that felt off or wrong. At the same time, protecting your car from serious damage is something that most drivers take seriously. 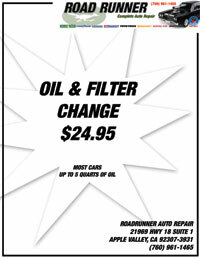 When you see the Check Engine light pop up on your car in the Victorville area, Road Runner Auto Care is available to diagnose your car and provide the service you need to get up and running with full peace of mind. The light is a sign that something in the car’s engine computer is returning an error. Our Victorville auto repair shop can diagnose the problem by reading the codes being transmitted by your car’s computer and tell you the next steps coming forward. The Check Engine light is an indicator that something is going wrong in your vehicle’s engine area. 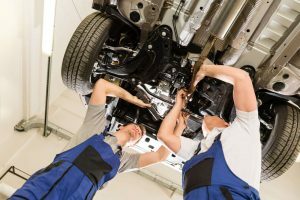 While it could be something as simple as an oxygen sensor or spark plugs that need replacement causing a misfire, you need a qualified auto repair technician in the Victorville area to examine your car for more serious issues like catalytic converter damage. In some cases, the Check Engine light is even caused by a loose gas cap! The Check Engine light can also indicate that your car is not meeting the standards required for the state of California for emissions production. If the light is on, your car may be emitting excessive emissions or consuming an excessive amount of gas. The vast majority of Check Engine lights are provoked by issues with your car that have the potential to impact its reliability and emissions production yet are also affordable to repair. Our auto care shop in the Victorville area can examine your car and put your fears to rest. We can provide your car’s diagnosis, and our trustworthy, reliable technicians can work with you to resolve problems and address your vehicle’s auto care needs. If you see the Check Engine light on your vehicle, don’t delay. There’s no reason to put off coming into Road Runner Auto Care to diagnose your Victorville vehicle and find out what you need to restore your car’s engine to full health.